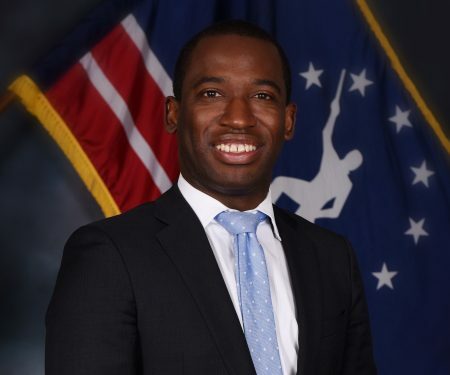 Richmond Mayor Levar M. Stoney will serve as Randolph College’s 2019 Commencement speaker on May 12. The ceremony will take place at 10 a.m. in The Dell. Stoney was raised in Virginia by his grandmother and his father, who was a custodian. A product of Virginia public schools, he grew up on free-and-reduced lunch and was the first in his family to earn a high school diploma. He went on to graduate from James Madison University, before moving to Richmond to begin a career in public service. After serving as a Governor’s Fellow in then-Governor Mark Warner’s office, he became the first African American Secretary of the Commonwealth of Virginia and the youngest member of Governor Terry McAuliffe’s cabinet. Stoney served as executive director of the Democratic Party of Virginia during a transformative time for the state, leading to President Obama’s historic Virginia victory in 2008. At the time, he was the youngest leader of a state democratic party in the country. In 2013, he served as the deputy campaign manager for Governor McAuliffe’s successful gubernatorial campaign. As secretary, he led the largest, most public-facing office of the governor’s cabinet and was the driving force behind transforming the process that restores civil and voting rights. Under his leadership, Virginia restored more rights than any other state in the country and more than the past seven administrations combined. In his first two years in office, Stoney has focused on education and providing for the whole child as a key element to building One Richmond: a more inclusive, competitive and equitable city. He raised $150 million to finance the construction of three new schools. Working with regional transit, he secured free bus rides for every Richmond Public high school student. And working with private and nonprofit partners, the administration now provides tablets and wireless service to incoming high school freshmen, expanded after-school programming and free eye screenings and glasses to any Richmond Public School student who needs them. He created the Monument Avenue Commission and convened the city’s first History and Culture Commission, which will solicit citizen input to help determine the best way to tell the full story of Richmond’s past. Most recently, Stoney expanded benefits for City of Richmond workers to provide eight weeks of paid maternity leave for birth mothers, and he launched an eviction diversion program—the first of its kind in the Commonwealth of Virginia—that provides services for families looking to avoid the cycle of debt and desperation that comes with losing a place to live. Under Stoney’s leadership, the city has committed to build more than 1,500 affordable housing units in the next five years and recently earned the highest year-to-year increase nationwide in the Human Rights Campaign’s Municipal Equality Index, which measures receptiveness and inclusiveness to the LGBTQ community. Richmond has recently been named the #2 Top Place Millennials are Moving by Time Magazine and a Top 25 Best Place to Live by U.S. News and World Report. Southern Living also named Richmond one of the South’s Best Cities. The Richmond Times Dispatch recognized Stoney as the 2016 Person of the Year. In June, 2017, he was named a Politico Rising Star. Stoney is also a 2006 alumnus of the Minority Political Leadership Institute in Richmond and serves on a number of civic and community boards including the VCU Massey Cancer Center Advisory Board; Great Aspirations Scholarship Program (GRASP), a college- access organization; NextUp, an after-school program network; and the Jamestown Yorktown Foundation 2019 Commemoration. A proud member of Richmond Crusade for Voters and the NAACP, he also serves as co-chairman of the Capital Region Collaborative and sits on the board of Venture Richmond. For more information about Commencement Weekend, please see http://www.randolphcollege.edu/commencement/.